We want to implement of a versatile reaction microscope, which allows for the study of the dynamics in interacting few-body Rydberg systems. We will set the grounds for this new experimental approach, which we intend to extend in the future to larger numbers of interacting particles. The setup is inspired by the COLTRIMS and MOTRIMS techniques, where atomic and molecular collisions are investigated in a kinematically complete way. Here, the systems under investigation are long-range Rydberg molecules and pairs of excited Rydberg atoms. 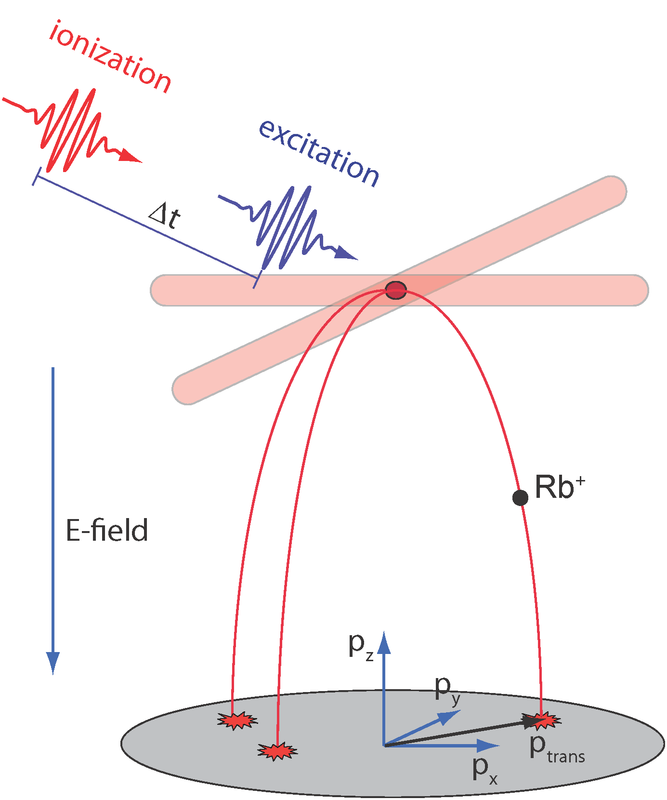 By carefully analyzing the trajectory of the recoil ions, which are created after a short photoionization pulse, the three-dimensional momentum distribution will be reconstructed. This allows for an in depth study of the dynamics of interacting Rydberg systems. This reaction microscope complements standard experimental techniques to study Rydberg gases, which so far focused on the spectroscopy of Rydberg atoms and Rydberg molecules, as well as on the spatial distribution of Rydberg atoms in dense driven samples. We will implement a dedicated apparatus to address the collision dynamics, mechanical forces and internal molecular processes in few-body Rydberg systems. We thereby promote the three-dimensional momentum distribution of the atoms as a new observable to characterize Rydberg systems. Because the involved processes in interacting Rydberg systems are much slower than the collisions in a traditional COLTRIMS experiment, not only the final momentum distribution after the dynamics can be measured, but also the dynamics itself can be monitored, thus going beyond the COLTRIMS technique. The project is located within the research areas ''Rydberg aggregates'' and ''Rydberg many-body physics''. We especially focus on the research topic ''exotic Rydberg molecules'', by investigating the static and dynamical processes involving Rydberg molecules. The study of forces between Rydberg atoms can be regarded as a microscopic bottom-up approach for the understanding of the fundamental interaction processes, which are exploited in the research area ''Rydberg many-body physics''.